What do a teenager crying for days after losing their first girlfriend, the startup founder funneling all of his families savings into a company, and the white collar worker too afraid to quit his job, all have in common? They’re each trapped in a bad situation because they’re overestimating the scarcity of what they’re clinging to. And you’re likely doing the same thing in your own ways. Looking at each situation closer shows what I mean by “overestimating scarcity” and how it makes us unhappy. The teenager is distraught over losing his girlfriend because he’s never had any other relationship. It took 15 years to find this one, will it be another 15 years for the next one? But then as he goes through 2, 5, 10 romantic partners, his belief in the difficulty of finding another one significantly decreases. He realizes that if a relationship ends, he’ll be able to find another, most likely better, one. His original belief in the scarcity of relationships was only imagined, and as he increased his exposure to the resource (love, companionship, etc.) then his confidence that he could find more of it went up as well. The startup founder is pouring all of his savings into his dying company instead of cutting the cord because he believes that it has to work because it’s such a great idea. He’s thinking “it’s such a good idea, it’ll take off soon, just a little longer” when in these situations it frequently never does and just ruins the founder’s family finances. But if he were in the habit of coming up with new ideas on a regular basis, he wouldn’t be so wedded to this one. Coming up with good ideas, especially for businesses, is a muscle that you train. No one’s born with it. As you practice thinking of ways to solve problems you start thinking up new startup ideas daily. Are they all home runs? No, but the knowledge that you’ll always have another idea prevents you from being obsessed with the first one. The white collar worker afraid to leave his job is scared that he won’t have another good opportunity. He might not be able to find another company that wants to hire him, or he might not get as high of a salary. But if he were in the habit of teaching himself new skills, looking at other jobs, talking to recruiters, trying small businesses of his own on the side, he’d quickly realize that he can learn new things and do new types of work or even start his own thing. But until he goes out and starts experimenting, he’ll feel trapped. 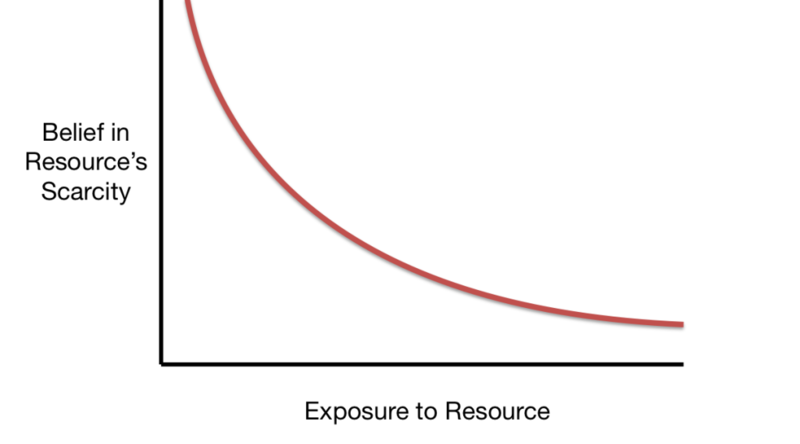 When we think something is scarce, assuming it isn’t a physical resource like oil, we’re wrong. We just haven’t had enough exposure to it to realize how abundant it actually is. I’m going to call this Nat’s First Law of Imagined Scarcity, at least until I find an existing concept that says the same thing (post in the comments if you know of one). 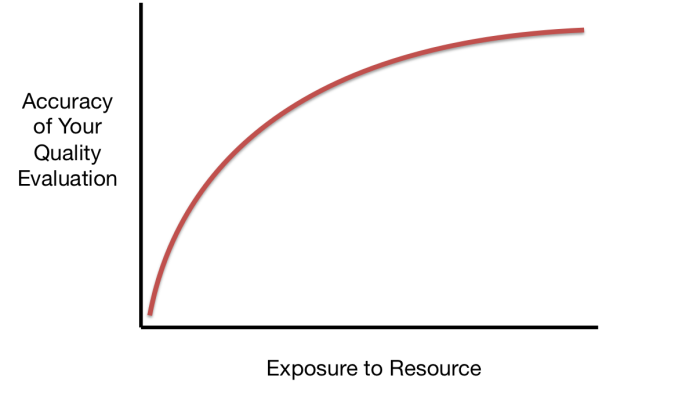 Your belief in the scarcity and value of any (metaphysical) resource is inversely proportional to your exposure to it. It’s a combination of the Availability Heuristic (but in reverse), Exaggerated Expectation, Scarcity Heuristic, and Endowment effect. And as illustrated by the examples, the law tells us that our first experience with something new will make us think it’s better or more valuable than it really is, and that we’re much less likely to find something as good as it again if we lose it. But the teen will find another girlfriend, the founder will come up with more ideas, and the worker will find another job. They only believe the opposite as a result of Imagined Scarcity. You’ve certainly experienced Imagined Scarcity in your own life. It doesn’t even have to be something big like in the examples. I just moved to Austin a few weeks ago, and thought the first food truck taco I had was the best ever… but 5 Tex-Mex restaurants later I realized I was wrong. Certainly any resource, metaphysical or not, has varying quality levels. There are terrible startup ideas like powdered alcohol, and great ideas like Slack, Uber, and Fratboxes. You can only accurately evaluate something’s quality when you no longer see it as scarce. The person who has only been in one relationship doesn’t know if they “truly love” someone, the person who has only had a couple startup ideas doesn’t know if one of them is good, and the person who’s only worked in one industry doesn’t know what kind of job they like. And, again with the small things, you don’t know what wine you like until you try a lot of it, and you don’t know what city you want to live in until you’ve visited a bunch of them. Imagined Scarcity causes us to overvalue those first experiences, so if you want to truly know the value of something, you first have to stop thinking of it as scarce. When you’re unaware of Imagined Scarcity, you unnecessarily fear loss and overvalue new things. First, even if you think that you can never replace something, you can. You’ll find another job, relationship, idea, bottle of wine, etc. and keep finding more of them. Second, even if you think that something is the best in its class, you’re likely just underexposed to other options. They’re all signs that you’re being affected by Imagined Scarcity and causing yourself unnecessary stress and unhappiness (or, at least, not as much happiness as possible). When you recognize them, you prevent yourself from being negatively impacted by them, and it frees you up to try more new things and take more risks than you might otherwise do. And, most importantly, it motivates you to figure out what’s truly the best for you.